Scalable Vector Graphics (SVG) is a language that describes two-dimensional vector graphics for storage and distribution on the Web. Unlike raster image formats, SVG-based images scale nicely to arbitrary resolutions and sizes. However, the current SVG standard provides little flexibility for taking into account varying viewing conditions, such as different screen formats, and there is little support for interactive exploration of a diagram. We introduce an extension to SVG called Constraint Scalable Vector Graphics (CSVG) that permits a more flexible description of figures. With CSVG, an image can contain objects whose positions and other properties are specified in relation to other objects using constraints, rather than being specified in absolute terms. For example, a box can be specified to remain inside another box, without being given an absolute position. The precise layout can then be left to the browser, which can adapt it dynamically to changing viewing conditions on the client side. Further extensions add support for alternate layouts, interaction, and declarative animation. Leveraging well-established methods for linear constraint solving, we implemented a prototype viewer for CSVG by embedding our Cassowary constraint solver into an existing SVG renderer. Keywords: constraints, differential scaling, semantic zooming, interaction, CSVG, SVG, Scalable Vector Graphics. The Scalable Vector Graphics (SVG) language  is a language based on XML  developed by the World Wide Web Consortium for describing two dimensional vector graphics for storage and distribution on the Web. SVG can dramatically improve graphics on the Web. In contrast to raster image formats such as GIF, JPEG, and PNG, which store a matrix of individual pixels that compose an image, an SVG image contains instructions for resolution independent rendering, so that the same SVG file can be shown in more detail when viewed at a higher resolution. SVG files are also more compact than raster images, easier to process and analyze, integrate well with Cascading Style Sheets (CSS)  and can make full use of the Document Object Model (DOM) . Given these advantages, SVG is increasingly well-supported by both commercial and free software. Although the SVG format is a huge step forward for many kinds of images, we can do even better for diagrammatic illustrations. In particular, SVG does not provide for flexible layout given different viewer requirements and browser capabilities, such as screen format and font preferences. Moreover, the support for interaction and animation in SVG is very limited. In this paper we demonstrate how extending SVG with constraints provides the basis for improving these aspects, thus significantly enhancing the flexibility of SVG. This is a modular extension to SVG that ensures upward compatibility with the original format. A constraint is a declarative specification of a relationship that we wish to hold true. For example, ``Format appears to the left of DateFormat'' is a constraint. We can write the constraint mathematically as: . In this constraint, we only specify the properties we wish to hold, but do not give concrete values, or an explicit method (an algorithm) for making the properties hold. The task of finding appropriate values is delegated to a constraint solver that is used during rendering. For example, assume that we want to display a part of the Java object hierarchy (Figure 1), but we want different layouts to be used in different viewing conditions so as to convey the information as clearly as possible. In a landscape format, we may want to use a diagram such as Figure 2, whereas a portrait format would be better served by the layout of Figure 3. Although these diagrams look very different, they have the same logical (topological) structure and semantics. Using SVG alone for this purpose presents a problem, because we are required to give absolute positions and sizes for the graphics objects. The only flexibility that SVG allows is uniform scaling of the entire graphic. 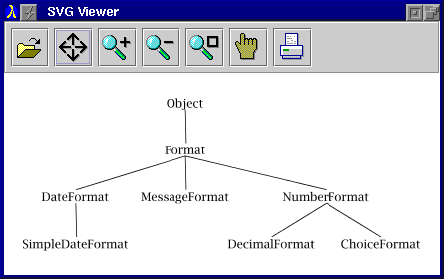 Figure 1: SVG image diagramming the object hierarchy for the Java.Text.Format class. The SVG source for this image appears in Figure 5. Figure 2: CSVG rendering of the Format class hierarchy inside a wide and short viewport. Figure 3: CSVG rendering of the Format class hierarchy inside a narrow and tall viewport. Another limitation of SVG is that it provides little direct support for interactive exploration of a diagram. In particular, the static nature of SVG forces authors to write scripts if they wish to maintain the layout relationships of objects in the diagram automatically, for example when an object in the diagram is manipulated interactively. This task is tedious, complicated, and tightly coupled to the specific illustration. Ideally, the new layout should be generated automatically by the browser based on a more abstract layout specification. 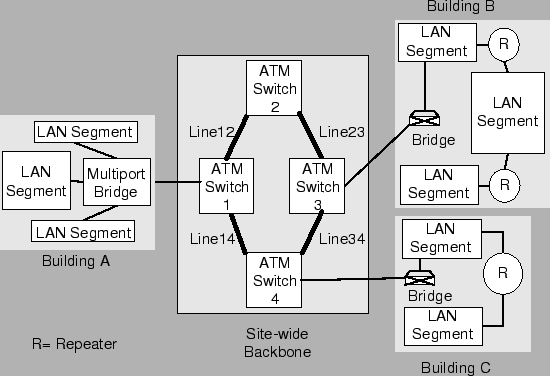 Figure 4: Various diagrams of a local area network. Relative to diagram (a), (b) illustrates semantic zooning, (c) demonstrates differential scaling, and (d) is an example of the output of a semantics-preserving transformation. 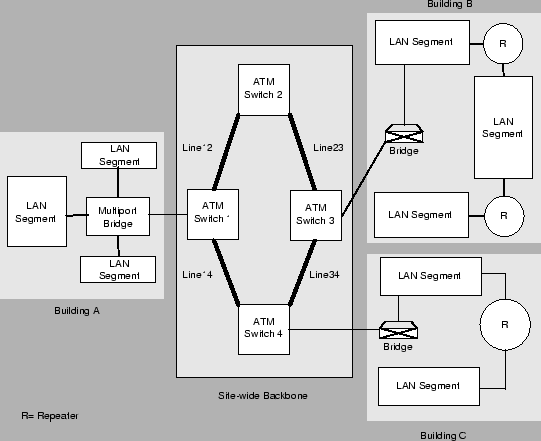 As another example, consider the Local Area Network (LAN) topology diagrams shown in Figure 4. 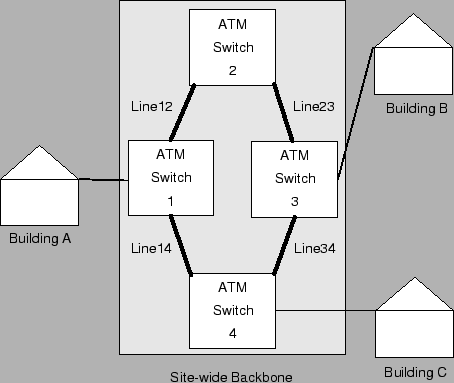 The network, shown in Figure 4(a), connects three different buildings -- A, B, and C -- via a site-wide backbone. Shrinking the whole diagram uniformly may cause buildings A, B, and C to become too small to display their internal details. By using an alternative presentation for each of the buildings we can support a more powerful form of resizing. Figure 4(b) shows a possible result. Zooming that preserves the semantic presentation of the LAN topology diagram but changes its appearance is called semantic zooming. Semantic zooming in combination with user interaction can allow viewers to explore a diagram interactively, selecting sub-components they wish to see in detail and hiding the details of other sub-components. Of course the diagram layout must change dynamically, preserving connections and also effectively utilizing the available screen space. We would also like SVG to provide a form of zooming that we term differential scaling. (Both semantic zooming and differential scaling are kinds of focus+context techniques .) In contrast to uniform scaling, differential scaling enables us to enlarge a part of a diagram to see more detail, while simultaneously shrinking another part, so that the overall screen area for the diagram is kept constant. This capability clearly involves scaling various parts of the figure differently. An important application of this non-uniform scaling is to the sizing of text in diagrams. A sight-impaired user, for instance, may want to shrink the overall size but to increase text font size in labels. As an example, see Figure 4(c), which contains the same graphical components as Figure 4(a) but with an increased text size for labels and smaller boxes. Note that this means different line breaking for the text in the labels. We would also like viewers to be able to change the layout of objects in the diagram interactively, without changing its semantic content or logical structure. Users should thus be restricted to performing semantics preserving manipulations. For example, Figure 4(d) shows a resized and rearranged diagram of the local area network example. 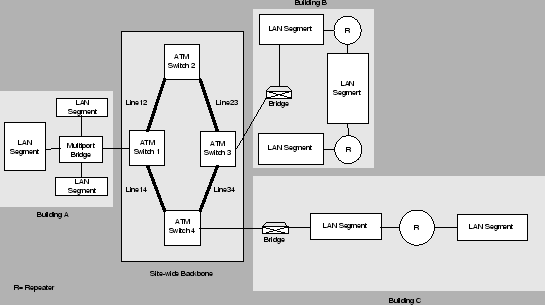 Here, the system preserves the connection information when the user extends the width of building C's bounding rectangle and interactively moves the LAN segment boxes as well as the repeater circle. The idea of interactive manipulation and exploration of a diagram naturally generalizes to an interaction metaphor in which the viewer uses the diagram as a simulation of some physical artifact and can explore ``what-if'' scenarios by direct manipulation and other interaction, as in the original ThingLab system . In section 3.2, we discuss an interactive abacus. The same principle can be further generalized to provide constraint-based animation . In addition to making the properties of some graphical objects dependent on the properties of other objects, and allowing the user to manipulate these properties interactively, we can also make these properties dependent on a timer variable. Using a constraint that relates object properties to a time offset gives us an immediate way to specify trajectories and other animation properties. In section 3.3, we discuss a seesaw animation. The above examples demonstrate how semantic zooming, differential scaling, semantics preserving manipulation, and animation greatly improve SVG's value. We shall show that constraint-based layout specification of SVG elements can be used as the basis for such dynamic layout and provide SVG with the desired capabilities. These constraint-based layout specifications are more abstract and flexible specifications of layout. In our Constraint Scalable Vector Graphics (CSVG) extension to Scalable Vector Graphics, images can use arbitrary linear arithmetic constraints to control the layout of shapes, lines, paths, and font sizes. The other primary additional capability provided by CSVG is allowing alternate layouts for the same logical group of components in a diagram. Which layout is chosen depends on testing preconditions at runtime, such as display window size or aspect ratio. The layout may also be chosen interactively by the user, allowing exploration of the diagram. a prototype implementation of a CSVG viewer based on the CSIRO SVG viewer . The prototype makes use of the sophisticated constraint solving algorithm Cassowary . In spirit, the Scalable Vector Graphics format is very similar to the PostScript page description language , but it uses XML syntax instead of postfix notation. Figure 5 gives an example. Figure 5: SVG source of the class hierarchy illustration shown in Figure 1.
describes a rectangle whose top-left corner is positioned at coordinate (20,10) with a width of 10 units and a height of 5 units. Lengths and coordinates can include explicit units, but when they are omitted, the user space coordinate system is used [16, Ch.7]. describes a rectangle path equivalent to the preceding rect element: first Move to (20, 10), then draw Lines to (30,10), (30,15), and (20,15), and finally close the path (Z). Uppercase command characters designate the use of absolute coordinates, while lowercase denotes relative coordinates. Other path sub-language commands include Curve-to, Smooth curve-to, Quadratic Bezier curve-to, and more. Other important elements include defs and use for defining objects and later referencing them, image for embedding raster image files (e.g., PNG or JPEG graphics), text for including text, and g for grouping sub-elements to be rendered as a single entity. The g element (as well as the basic shape elements) has an attribute transform whose value is a list of translating, scaling, rotating, or skewing transformations that will be applied to the grouped shape before final rendering. One of the more complex features of SVG is that objects may be positioned and dimensioned relative to a transformation frame or in absolute units. and the selected element will be scaled to twice its normal size. The SVG DOM can be used in combination with scripting and event handlers (e.g., mousedown, onclick) to permit some useful interactive capabilities. The conventional means of delivering an image across the Internet is in a rasterized image format such as PNG or JPEG (Figure 6). The resolution is fixed when that file is created, and the artifact the user receives is inflexible. The adoption of the SVG image format permits a different delivery mechanism (Figure 7). The high-level image description is stored in the SVG image format, preserving much of the semantic value provided by the author. That SVG file is then sent across the network. An SVG renderer on the client side chooses the resolution and creates a rasterized display of that image specially-tuned for the display device and the desired size. The key observation concerning the evolution from raster images to SVG is that we are sending a higher-level description across the network and moving some of the processing of the image from the server side to the client side. Thus, the artifact sent across the Internet is more flexible--it can be used as the source for generating a high-quality printout of the image, to create a low-resolution thumbnail of the image, or even to ``render'' the image aurally using speech synthesis to describe the diagram. The decision of how to present the image is made with input from the user, and from the browser and other client-side software. Style sheets provide yet another way to increase the flexibility of the image sent over the network: not only is the resolution left undetermined, but the final decision as to such aspects as the coloring scheme, can be delayed until after applying style sheet declarations. Our constraint extension to SVG permits describing the author's layout intentions, and defers the actual positioning and sizing of the image's elements until just before final display for the user (Figure 8). To support this greater flexibility, we have made four extensions to the SVG language. 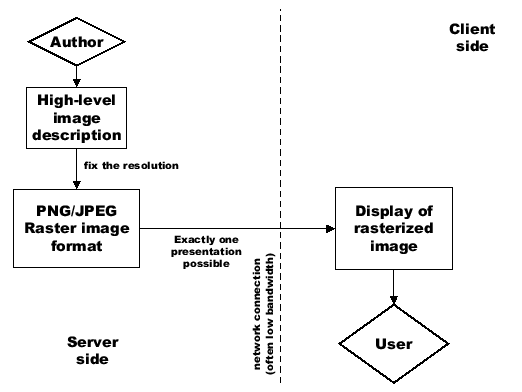 Figure 6: Conventional process of delivering a raster image across the network. 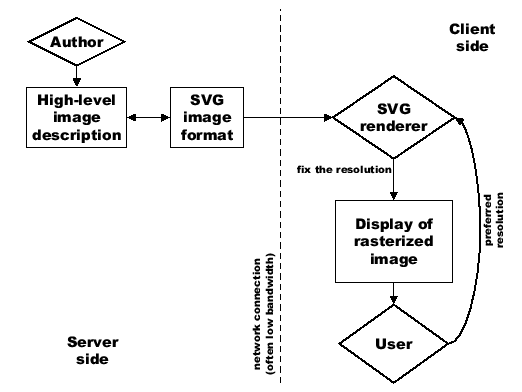 Figure 7: Process of delivering a resolution-independent SVG image across the network. will have six predefined variables based on its id attribute: rectA_x, rectA_y, rectA_width, rectA_height, rectA_rx, and rectA_ry; one for each attribute value. Because identifiers are found in its attributes, this rectA will have both rectA_width and rectA_height variables constrained to be equal to the square_edge variable. Constraint variables may also be declared explicitly by using a new var element, in which case they have as optional attributes a stay weight, sw, an edit weight, ew and a preferred value, value. The stay weight indicates the ``inertia'' of the variable--how strongly it likes to keep its current value--while the edit weight indicates how important it is to change this variable during interaction when it is directly manipulated. Although numeric values can be used for weights, it is usual to use symbolic names such as strong and weak. An important use of stay weights is to enforce stability in graphical layout. Every constrained attribute implicitly has a weak stay constraint which states that its value only be changed as little as possible. Such stay constraints make objects remain in place unless some other stronger desire forces a change. which defines a square whose edge length is at least 50.1 The rule implicitly introduces the new constraint variable, square_edge. Constraint strengths allow the designer to specify a relative ordering of the importance of constraints. If there is a conflict, the stronger constraints will be given preference. There are different ways to resolve conflicts among constraints with the same strength ; in our implementation we minimize the weighted sum of their errors. Given a system of constraints, the constraint solver must find an assignment to the variables that satisfies the required constraints exactly, and the solution should satisfy the preferred constraints as well as possible, giving priority to the more strongly preferred constraints and taking into account edit and stay weights. Third, we add several built-in read-only constraint variables. (A read-only variable is one that cannot be changed by the solver to satisfy the constraint in which it occurs .) Two variables, viewport_width and viewport_height, are used to allow the image to be influenced by the size of the display area. We expose current_time and current_time_squared which are both ever-increasing read-only variables that allow CSVG to support the declarative specification of time-based animations more directly than the animate elements. Fourth, we have added alternate layouts for groups of SVG elements. For this purpose a new docase element containing one or more gcase element(s) is defined. Each gcase element specifies an alternative version, with the version chosen depending on which pre-condition holds. The gcase element simply extends the SVG g element with a case attribute. Such group alternatives were used in the LAN example in Figure 4 to collapse subdiagrams when the available display area becomes too small. Note that such pre-conditions must be re-checked when viewing parameters change, because the truth values can change dynamically (for example, due to resizing). Therefore they, too, must make use of the constraint-solver. However, they treat the constraint variables as read-only. Pre-conditions are not the only way to choose a group case. It is also possible to switch to an alternative case interactively in the browser. Consider a scenario where the browser collapses some sub-diagram because of a lack of display space, but the user needs to see the details of this group. The user can thus decide to expand the subgroup explicitly, but since the overall size of the diagram will exceed the display area, the user will have to empoloy scrolling to view the rest of the diagram. 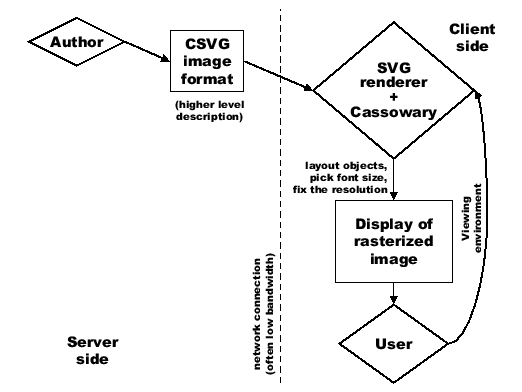 Figure 8: Process of delivering a CSVG image across the network. We can rewrite Figure 5 to specify constraints on the layout of the class hierarchy, rather than giving exact locations for all the parts of the illustration. Our CSVG description of the image looks like the ordinary SVG image (Figure 1) under ``ideal'' viewing conditions. However, the CSVG file is far more flexible, and it will appear as shown in Figures 2 and 3 when the viewport dimensions are altered. An ordinary SVG file would always appear as just a uniformly scaled version of Figure 1. For our CSVG version of the class hierarchy, we use a total of 109 constraints. Each viewing condition, either portrait or landscape format, employs 53 constraints that reflect typical layout desires for viewing trees: nodes at the same level are aligned horizontally (8 constraints), different levels are spaced at equal vertical intervals (8 constraints), and all lines must connect at the midpoints of nodes (28 constraints). Of the remaining 9 constraints for each alternative format, 8 are used to maintain the midpoint of nodes and 1 is used to divide the viewport into columns. The other constraints are for defining constants such as vertical interval and the viewport midpoints. An abridged version of the CSVG source appears as Figure 9. See section 4 for timing details of this and following examples. 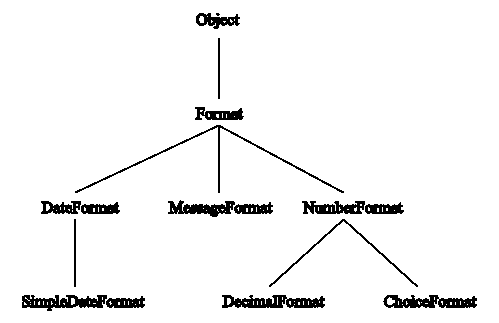 Figure 9: CSVG source of the object hierarchy for the Java.text.Format class. 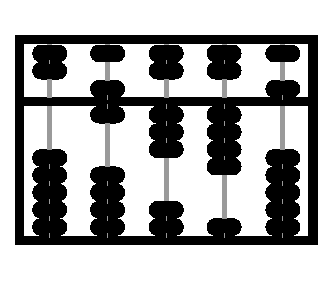 Consider the abacus shown in Figure 10, inspired by an earlier constraint-based applet . The diagram allows the user to select and move beads on the abacus. Each bead is constrained to behave like the physical object and so must move along the rod and cannot pass through another bead or through the bar. For example, these constraints ensure that if the user grabs a bead and pushes it upwards all the beads above it will automatically be pushed with it. This interactive abacus CSVG file has a total of 185 constraints and 419 variables. Each column of beads has 37 constraints that keep the beads attached to the rod (7 constraints), maintain the bead size (7 constraints), ensure the beads to stay in the frame (4 constraints), and keep the beads in their relative order (19 constraints). 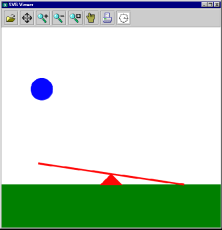 Constraints relating object positions to the current time can be used to support simple animations. Layout constraints are even more compelling when parts of the image are moving: the positions of the remaining objects can be described at a high level, knowing that the solver will animate whatever other objects need to move to maintain the specified desires. 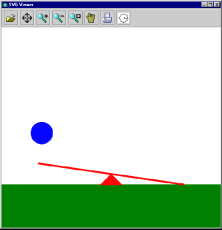 Figure 11 shows four screenshots of our CSVG prototype rendering an animation of a ball falling on a seesaw. The seesaw.csvg image contains 18 constraints to support the animation: 12 for the positions of the various elements, 1 relating the ball to the current_time_squared built-in variable, 1 stating that the ball must remain above the left edge of the seesaw, and 4 describing that the seesaw can go neither through the floor nor through the fulcrum. 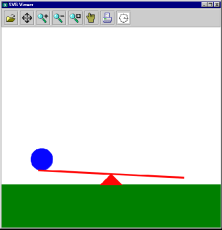 Figure 11: CSVG animation of a ball falling towards seesaw. 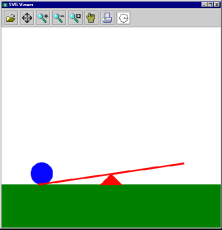 The position of the ball is directly related to the square of the time offset, and the seesaw moves because of constraints describing its behavior. On the client side of the pipeline, we have implemented a CSVG viewer to experiment with the additional expressiveness it provides. Our prototype is based on version 0.71 of the CSIRO SVG Viewer  which is implemented in Java and uses IBM's XML4J parser version 2.0.15 . Figure 12 presents the system architecture. Figure 12: Architecture of our implementation. As with any XML language, CSVG is defined by its Document Type Definition. Our CSVG DTD is a straightforward extension of the SVG DTD. To the list of permissible children of SVG group elements (svg and g elements), we added the var, constraint, and docase elements. Then, we added the definition of each new element and its attributes. 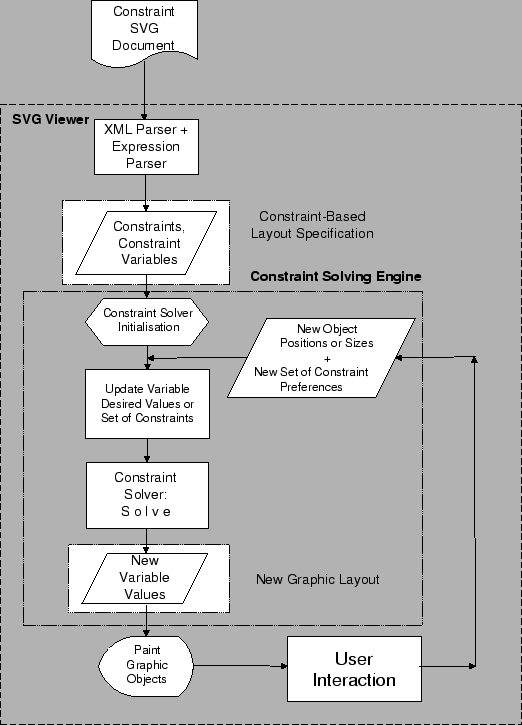 After the XML parser reads in the SVG document, we create all the variable and constraint objects of the document, then we feed them to a constraint solving engine. When the solution is available, the viewer renders the graphic objects. Every time a user initiates a resize or movement of an object, the new size or coordinate position of the object is used for setting the associated constraint variables' desired values. The constraint engine then is called to find another solution that reflects the new presentation of all graphic objects in the layout. The same process happens when the validity of group pre-conditions changes due to interactive manipulation. When switching to a different gcase element, the constraints and variables of the previous gcase element are removed from the engine, and the new set of constraints and variables are added before we re-solve the system. The constraint solver is a core part of the implementation. The current implementation employs a Java implementation of the Cassowary constraint solving algorithm [3,9,27]. This solver supports arbitrary linear arithmetic constraints (both equalities and inequalities over real-valued variables). Cassowary handles cycles without difficulty and handles both required and preferred constraints. The algorithm it employs is an incremental version of the simplex algorithm that we have optimized for interactive graphical applications. to move to the absolute coordinates held in x and y, and then draw a line to the relative coordinates contained in variables dx and dy. We tested the performance of our prototype using a Dual PentiumII 450 MHz machine running Java 1.2 with the HotSpot virtual machine under Windows NT 4.0. For the class hierarchy example, adding the constraints and the initial solve requires 266 ms. Subsequent re-solves of the constraint system when changing viewing format requires less than 200 ms. For the abacus example, adding all of its constraints and variables to the solver and letting the solver initialize itself requires 485 ms. Subsequent re-solves of the constraint system when moving a bead along its rod require about 16 ms each. There is a long history of using constraints in interfaces and interactive systems, beginning with Ivan Sutherland's pioneering Sketchpad system . Juno-2 is a more recent constraint-based drawing application . Constraints have also been used in several other layout applications. IDEAL  is an early system specifically designed for page layout applications. Harada, Witkin, and Baraff  describe the use of physically-based modeling for a variety of interactive modeling tasks, including page layout. GLIDE  uses visual organization features (VOFs) to control layout of arbitrary graphs using a spring metaphor and an iterative numeric solver. Numerous systems use constraints for widget layout [28,29], and Badros  uses constraints for window layout. We have previously introduced CCSS, an extension of Cascading Style Sheets with constraints . Our CSVG motivation and philosophy is analogous to that of CCSS, and CCSS is directly applicable to controlling style properties of CSVG documents as well. The primary addition of CSVG beyond CCSS is the ability to control non-style properties of SVG elements. This feature is necessary to control layout because the positions of those objects are determined not by style properties but by element attributes. An earlier paper  had goals similar to CCSS, but did not integrate as well with the emerging web standards. Other style sheet languages including PSL (Proteus Style Language) , DSSSL (Document Style Semantics and Specification Language) , and XSL (eXtensible Style Language) , delay finalizing various presentational attributes of a figure until later in the delivery process, closer to the viewing user. None of these style languages, however, attempt to preserve layout desires to perform layout dynamically on the client side. Diehl and Keller describe constraint extensions to the Virtual Reality Markup Language (VRML) . Their extension provides both local propagation constraint solving and also finite domain constraint solving. However, it does not provide arbitrary linear arithmetic constraints which we believe are the minimum required to adequately model geometric attributes. The animation aspects of SVG and CSVG are related to the Synchronized Multimedia Integration Language (SMIL) . Another project called Madeus has used the Cassowary solver to handle a wider range of constraints in multimedia documents . Madeus provides support for both temporal and spatial relationships, and includes a rudimentary authoring environment. Our constraint extension to SVG provides useful new expressiveness for describing illustration graphics at a higher semantic level. CSVG permits deferring the actual layout of the objects in the figure until client-side rendering, thus resulting in greater flexibility in dealing with varied viewing environments and user desires. In particular, it allows semantic zooming, differential scaling, and semantics preserving manipulation and interaction. In addition, it provides a unifying basis for interaction and animation support. There are substantial opportunities for future improvements of CSVG. Constraint-based graphics documents are difficult to author, and currently there are no authoring environments for generating CSVG at the appropriate level of abstraction. It is essential that drawing programs permit users to specify constraints interactively, maintain them dynamically throughout editing, and ultimately reflect those constraints in the saved CSVG file. Constraint-based graphics editors such as Cooldraw , Aldus Intellidraw , and Noth's CDA , as well as SVG-capable editors such as Adobe Illustrator or Sketch , may provide a useful starting point. would permit easier specification of the intention that a set of basic shapes are aligned in a row by their vertical centers. Constraints at this level also avoid problems that arise when object structure changes. Suppose a basic shape is removed from a diagram (e.g., manipulating the SVG DOM). In such a case, should indirect relationships through that object remain or be removed? If only the primitive constraints are present, the situation is ambiguous. With multiple objects being aligned with a single declaration, the answer is clear--those objects should remain aligned. An important direction for future work is to extend the power of the constraint solving algorithm, which currently only allows linear constraints. This limitation is not implicit in the design of CSVG, but is imposed by the solvers used in the current implementation. In particular, we are working on support for arbitrary one-way and multi-way constraints . For example, a text element in a CSVG document could be constrained to display the coordinates of a circle: moving the circle would update the string, and editing the string would move the circle. Another area for future work is to better describe the semantics of SVG in terms of constraints and constraint hierarchy theory. This direction is similar to what we did for Constraint Cascading Style Sheets  and it may provide a unifying implementation mechanism for existing aspects of SVG as well. In particular, some of the scripting events, such as onMouseMove, may be handled within this framework: a discrete action (such as a button press) establishes a connection that then is managed via a constraint relationship until a subsequent action removes the constraint . In conclusion, CSVG provides a surprising amount of expressiveness at a minimal implementation complexity and a low performance cost. Thanks to Vincent Hardy of the SVG Working Group for his helpful feedback on our work, and to Jeffrey Nichols and Denise Pinnel for their comments on a draft of this paper. Also thanks to Jeffrey for his work on the CSVG web site. This research has been funded in part by a U.S. National Science Foundation Graduate Research Fellowship and the University of Washington Computer Science and Engineering Wilma Bradley fellowship for Greg Badros, in part by NSF Grant No. IIS-9975990, and in part by an Australian ARC Large Grant. Addison-Wesley, Reading, Massachusetts, 2nd edition, 1990. V. Apparao, S. Byrne, M. Champion, S. Isaacs, I. Jacobs, A. Hors, G. Nicol, J. Robie, R. Sutor, C. Wilson, and L. Wood. Document object model (DOM) level 1. G. Badros and A. Borning. The Cassowary linear arithmetic constraint solving algorithm: Interface and implementation. Technical Report UW-CSE-98-06-04, University of Washington, Seattle, Washington, June 1998. G. Badros, A. Borning, K. Marriott, and P. Stuckey. Constraint cascading style sheets for the web. In Proceedings of the 1999 ACM Conference on User Interface Software and Technology, November 1999. G. Badros and M. Stachowiak. Scwm--The Scheme Constraints Window Manager. The programming language aspects of ThingLab, a constraint-oriented simulation laboratory. ACM Transactions on Programming Languages and Systems, 3(4):353-387, October 1981. A. Borning, B. Freeman-Benson, and M. Wilson. Lisp and Symbolic Computation, 5(3):223-270, September 1992. A. Borning, R. Lin, and K. Marriott. In Proceedings of 1997 ACM Multimedia Conference, 1997. A. Borning, K. Marriott, P. Stuckey, and Yi Xiao. Solving linear arithmetic constraints for user interface applications. In Proceedings of the 1997 ACM Symposium on User Interface Software and Technology, October 1997. B. Bos, H. Lie, C. Lilley, and I. Jacobs. W3C Working Draft, January 1998. T. Bray, J. Paoli, and C. Sperberg-McQueen. S. Diehl and J. Keller. In Proceedings of the Web3D-VRML 2000 fifth symposium on Virtual reality modeling language, Monterey, California, February 2000. Animation using temporal constraints: An overview of the Animus system. ECMAScript language specification, 3rd ed., December 1999. Scalable vector graphics (SVG) 1.0 specification. W3C Working Draft, December 1999. Converting an existing user interface to use constraints. In Proceedings of the ACM SIGGRAPH Symposium on User Interface Software and Technology, pages 207-215, Atlanta, Georgia, November 1993. M. Harada, A. Witkin, and D. Baraff. Interactive physically-based manipulation of discrete/continuous models. In SIGGRAPH '95 Conference Proceedings, pages 199-208, Los Angeles, August 1995. ACM. Sketch, a vector drawing program for unix. A. Heydon and G. Nelson. The Juno-2 constraint-based drawing editor. Technical Report 131a, Digital Systems Research Center, Palo Alto, California, December 1994. P. Ion and R. Miner. Document style semantics and specification language (DSSSL). R. J. Jacob, L. Deligiannidis, and S. Morrison. ACM Transactions on Computer-Human Interaction, 6(1):1-46, March 1999. P. Marden, Jr. and E. Munson. PSL: An alternate approach to style sheet languages for the world wide web. Journal of Universal Computer Science, 4(10), 1998. K. Marriott, S. Chok, and A. Finlay. A tableau based constraint solving toolkit for interactive graphical applications. In International Conference on Principles and Practice of Constraint Programming (CP98), pages 340-354, 1998. B. Myers, D. Giuse, R. Dannenberg, B. Vander Zanden, D. Kosbie, E. Pervin, A. Mickish, and P. Marchal. Garnet: Comprehensive support for graphical highly interactive user interfaces. B. Myers, R. McDaniel, R. Miller, A. Ferrency, A. Faulring, B. Kyle, A. Mickish, A. Klimovitski, and P. Doane. The amulet environment: New models for effective user interface software development. IEEE Transactions on Software Engineering, 23(6):347-365, June 1997. R. Rao and S. Card. In CHI'94 Conference Proceedings, pages 318-322, 1994. B. Robinson and D. Jackson. K. Ryall, J. Marks, and S. Shieber. An interactive constraint-based system for drawing graphs. In Proceedings of the 1997 ACM Conference on User Interface Software and Technology, Banff, Alberta Canada, October 1997. M. Sannella, J. Maloney, B. Freeman-Benson, and A. Borning. Multi-way versus one-way constraints in user interfaces: Experience with the DeltaBlue algorithm. Software--Practice and Experience, 23(5):529-566, May 1993. In Proceedings of the Spring Joint Computer Conference, pages 329-346. IFIPS, 1963. L. Tardif, F. Bes, and C. Roisin. In Proceedings of the Second International Conference and Exhibition on the Practical Application of Constraint Technology and Logic Programming, Manchester, United Kingdom, April 2000. A high-level language for specifying pictures. ACM Transactions on Graphics, 1(2):163-182, April 1982. Several edits by hand followed. Our syntax was chosen for simplicity and conciseness. We also considered using MathML  syntax for constraint specification: it has the advantage that standard XML parsers can parse the constraint properly, but is considerably more verbose and complicated.